Ay ay ay. That’s Spanish for “oh dear ” for all you Whole Foods patrons out there. Truth be told, I’m actually a Whole Foods whore. I don’t use that term often, or ever, but my husband and I frequent Whole Foods more than church. Pray for us. At least our earthly bodies are saved from evil ingredients. When I first heard about the two employees at a Whole Foods in New Mexico getting suspended for speaking Spanish to each other on the job, I wasn’t surprised. As a proud Yuppie Chicana residing is Albuquerque and fluent in Spanish, I’ve grown used to the dichotomy of living in a state with the name Mexico in it yet finding very few proud Mexican Americans willing to converse in Spanish. Then it was brought to my attention that it happened at a store we frequent almost daily. So I put in a call to Ben Friedland, the regional manager’s office and was quickly directed to his email. Here’s what I want him to know. 1. I understand that every company reserves the right to create their own rules and regulations subject to state and federal laws so if you’re going to work there, you better abide by them. 2. As a patron of your store, I appreciate uniformity, but I value culture more. 3. We’re not buying your story that the employees were suspended because they misunderstood the policy. They are bilingual not idiots. Food preparer number one and food preparer number two were over heard laughing and enjoying their day which pissed someone or several people off. Paranoia set in. The other employees began to suspect they were being talked about or worse, made fun of. If you’ve ever gotten your nails done, you know what I’m talking about. Sometimes as second, third or even fourth generation Americans, we forget to appreciate the immigrant experience when it’s happening right in front of our eyes. I don’t know if the employees that were suspended are immigrants, but I do know what it’s like to hear your native language or your parent’s native language and the effect it has on your soul. It’s a beautiful effect. When people from other cultures or countries can complain about their wives, brag about their kids or bond over their work in their native tongue, it lifts their spirits. When you and I are having a bad day, what do we do? We pick up the phone or walk over to someone to talk. It’s called shooting the “you know what” because you don’t stop to organize your thoughts, correct your grammar or syntax. You just say what’s on your mind in the easiest form possible and it relieves a Whole lot of stress. This reminds me of the time I walked into our local Whole Foods in search of an appetizer for a cocktail party we were invited to. I had the perfect appetizer in mind. 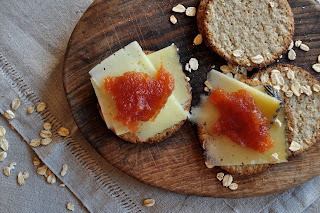 Manchego cheese and quince paste. I found the Manchego cheese with no problem but then began to wonder the store aimlessly in search of the quince. An employee came to my aid and when she asked me what I was looking for; I confidently told her I needed 15 paste. She looked at me puzzled. You see, I truly thought the name of the jam was in Spanish so I pronounced quince as in the number 15 in Spanish. Thankfully, it happened in Albuquerque and the girl smiled sweetly and directed me to my jam. She kindly pronounced it correctly for me and I turned beet red. Thank goodness for bilingual employees when you need them!